Access a Word document template of the Course Outline Guide that can be edited and used for your course. For ease of reference, the content from the Course Outline Guide is provided below. Course outlines are intended to provide students with an overall plan for your course, in order to enable them to function efficiently and effectively in the course. A course outline is generally divided into the sections described in the following pages. This Course Outline Guide provides a template that you may use as you develop or revise your own course outline. Items in bold print are required to be included in course outlines, which must be provided to students during the first week of classes according to the McGill Charter of Students' Rights (Chapter One, Article 21 - amended by McGill Senate 25 October 2017). Text in italics provides additional helpful information. You may modify this document (add/delete sections) as you like, provided that the items referred to in bold print remain. The course outline may be either posted on myCourses or distributed as a printed version; the choice is at your discretion. This Course Outline Guide is a dynamic document. If you have any suggestions, questions, or if you would like to share your course outline as a model for other instructors, please tls [at] mcgill.ca (be in touch)! If your Faculty has its own template, please tls [at] mcgill.ca (contact us). Thanks! The Teaching Preparation Checklist may also be of interest as you prepare for your course. Request tls [at] mcgill.ca (in-person assistance): Teaching and Learning Services (TLS) is available to assist individual professors, departments and Faculties with various aspects of curriculum and course design, and the teaching and learning process. Enter the course description as it appears in the eCalendar. Go to https://mcgill.ca/study to open the eCalendar, then enter the course number in the search field to find your course. Learning outcomes are clear statements of the knowledge, competencies or skills you expect students to have acquired by the end of the course (e.g., “By the end of this course students should be able to synthesize information from..." or “make predictions” or “solve problems”). Learning outcomes provide more detailed information about the course goals or objectives. Provide a brief description of instructional approaches that will be used during the course (e.g., lectures, seminars, laboratory or clinical activities, group projects). You may also choose to include additional information relevant to this course, such as attendance requirements, and classroom etiquette. Also mention intended use of technologies such as polling, videoconferencing, and myCourses. View sample statements regarding polling. All instructors are strongly encouraged to conduct mid-course evaluations (examples here). Advising students of mid-course evaluations ahead of time will likely lead to more constructive feedback. Provide specific information about required readings, including title, author(s), edition number and availability (from where they can be purchased or borrowed). It is helpful to the students to indicate how each reading relates to a particular topic in the course. Course Packs can be made available at the library branches, along with print and online links for the materials listed in these Course Packs. Please share your lists of course materials with your Liaison Librarian. You can work with your Liaison Librarian to create links to the library’s Course Reserves and online resources in myCourses – see this Checklist for details. If optional materials (e.g., recommended readings) exist, list them here. If appropriate, explain what the course is not about or what topics will not be covered. 1 e.g., topic, content, associated readings, activities. e.g., quiz, paper, group project, exam. It is strongly recommended that variations in schedules, e.g., due to holidays and reading week, be indicated. A description of the means of evaluation to be used in the course: The purpose of evaluation is to provide feedback to students on their learning, as well as to permit the instructor to assign a fair grade at the end of the course. Providing explicit information about assignments and grading procedures will clarify expectations and allay student anxiety, while supporting students in pacing their studies, gauging their progress, and achieving learning outcomes. When planning your examinations and assignments, make sure to consult the University Student Assessment Policy. Explicit information about assignments (e.g., length, breadth, submission instructions) can also be provided as part of the course outline, but this may be more easily provided later in the course, as assignments are presented. Some instructors prefer to hand out a description sheet for assignments before each is due, responding to any questions at that time. If students are submitting assignments electronically, this should be done either via myCourses or McGill e-mail. In the former case, include the FAQs for students using myCourses: Assignments in the course outline. Note: In courses in which acquiring proficiency in a language is one of the objectives, the assessments shall be in the language of the course. Additional policies governing academic issues which affect students can be found in the McGill Charter of Students’ Rights (see document). Guidelines for the use of mobile computing and communications (MC2) devices in classes at McGill have been approved by the APC. Consult the Guidelines for a range of sample wording that may be used or adapted by instructors on their course outlines. Whenever possible, include the costs of textbooks, course packs, and other materials to help students plan their budgets. More policies and guidelines are available here. 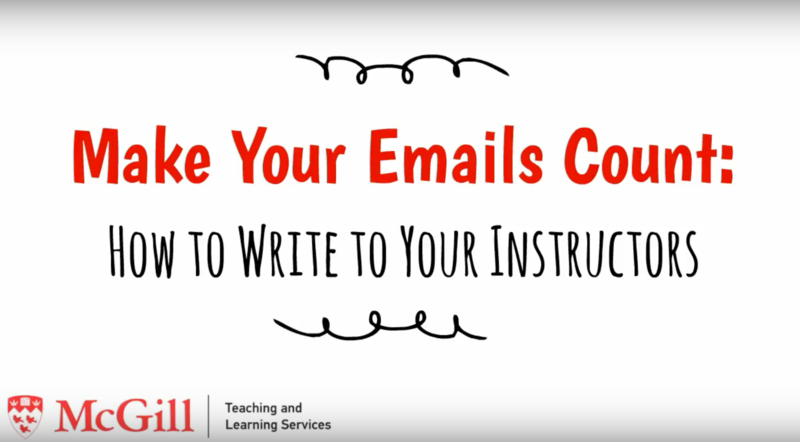 Help students hone their email communication skills by adding a link to this short instructional video by TLS in your course outlines and to your myCourses sites. This podcast from the IDEA Center explores the history, purpose and potential of the course syllabus (also referred to as a course outline), including both student and instructor perspectives. The podcast is accompanied by related web resources, including examples of (info)graphic syllabi.